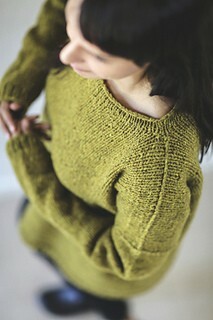 The Easy Bulky One Pattern by Joji Locatelli - Woolly&Co. 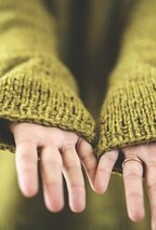 The Easy Bulky One is the simplest, easiest, quickest and dearest sweater renowned designer Joji Locatelli has ever designed. Upper arm circumference: 11½ (12, 12½, 14½, 16, 17, 18¾, 19½) inches; 28.5 (30, 31.5, 36.5, 40, 43, 47, 48.5) cm. 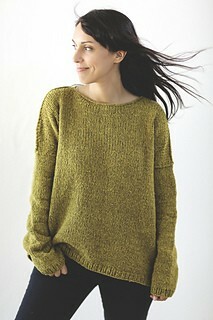 Yarn: 5 (5, 6, 6, 7, 7, 8, 8) skeins of Quarry by Brooklyn Tweed (100% woolen spun wool; 200 yards 183 m/100g) or approx. 960 (1000, 1060, 1140, 1340, 1440, 1560) yards; 880 (915, 970, 1040, 1135, 1225, 1320, 1430) m of lofty bulky weight yarn. The sample was made using colorway Citrine. Needles: US 9 (5.5 mm) circular needles. 12 st and 20 rows to 4” (10cm) in Stockinette St on US 9 (5.5 mm) needles. 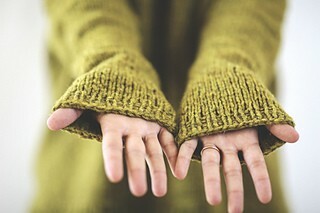 Before you measure, please take the time to wash and block your swatch in the same manner that you will wash and block your sweater.